Rudy Giuliani just put out a big health care plan, but he might need a few more hours with the briefing books. Asked about an ongoing debate about renewal of the Children’s Health Insurance Plan, the former New York major mixed up Medicare and Medicaid. Medicare is typically for older people; Medicaid is for poor people. The House bill would cut certain Medicare payments to help pay for kids’ health coverage. “The problem with it, it actually would bring cuts to the Medicare alternative, which is the worst thing we could do, because it then takes money away from seniors,” said Mike Huckabee, former governor of Arkansas. While the House version would reduce payments to Medicare Advantage plans, this would not necessarily reduce spending on patients. It costs twelve percent more to care for patients under Medicare Advantage plans than under the government Medicare program. Half this extra money is pocketed by the insurance companies, and the Medicare Advantage program is expected to cost taxpayers an additional $54 billion over the next five years. It would be better to end subsidies to insurance companies under these plans and spend the money on health care. In 2003 one reason I decided to support John Kerry’s health care plan, besides the inherent benefits of his plan, was that I feared this might be our last chance to solve health care problems without returning to much more intrusive ideas such as HillaryCare or government run health care programs. One election cycle later, we see many in the liberal blogosphere calling for a single payer plans. While the candidates, other than Dennis Kucinich, still do not support a single payer plan, some of the plans proposed this year do contain more mandatory government involvement than Kerry’s more voluntary plan. In addition to reducing mortality, new medical techniques can also have a huge effect on the quality of life. Roughly 250,000 hip replacements are performed in the US each year. Under-60 patients are becoming more important as newer artificial joints prove their capacity to withstand more active lifestyles. At $6,000, the average cost of a hip replacement is only a thousandth the cost of what it supposedly took to implant a bionic arm, eye, and two legs on the fictional The Six Million Dollar Man in the popular mid-1970’s TV show. Of course, hip replacement patients don’t get superhuman speed, strength, and vision – at least not yet. If Tour de France officials think they have big problems now with steroids, just wait 10 years. In principle, greater use of market mechanisms to allocate health care can slow or even temporarily reverse the rise in healthcare costs. But improved efficiency has its limits. Ultimately, the evidence suggests that societies spend ever-larger fractions of their income on health over time, in contrast to food expenditures, for example, which fall as countries become wealthier. Spending pressures, in turn, lead to acceleration of innovation. This raises long-term wellbeing all around, but exacerbates short-term inequalities and frictions. Arnold Kling responds by claiming to be exposing a health care fallacy, but actually repeats a common fallacy on the right that people can afford health care if we were only to eliminate unnecessary services. While there is some money spent unnecessarily, this represents a small proportion of health care dollars. Kling writes, “Getting a colonoscopy every five years after you turn age 50 may be a helpful precaution against colon cancer.” For most people screening colonoscopies are actually recommended every ten years, with screening at five year intervals being reserved for those with a history of potentially precancerous polyps and a higher risk of developing cancer. Terminating such screenings could increase health care costs if we wind up treating more people for colon cancer. It is not only the expensive procedures which cause financial problems. Even the intensive routine care of diabetics which studies prove will reduce morbidity and mortality are expensive when the costs are totaled. Turning health care costs over to individuals as conservatives advocate will result is less preventative care and less routine care of chronic diseases, increasing costs in the long run. It is far more cost effective to assist individuals in receiving aggressive care of diabetes and hypertension at an early age than to pay for renal dialysis, coronary artery bypass grafts, and post-stroke rehabilitation or nursing home care. Sen. Chuck Hagel, the Senate’s toughest Republican critic of President Bush’s war policy, has not ruled out a campaign for the GOP presidential nomination and will use the August congressional recess to make up his mind. A major reason for the unexpectedly strong professions of support for Rep. Ron Paul’s libertarian-conservative candidacy is that he is the only announced Republican presidential candidate opposed to the invasion of Iraq. Hagel as an anti-war candidate might attract a broader base of support than Paul. He has received many offers of financial support should he run. Hagel must decide what to do in 2008: to run for president, to run for Senate re-election or to get out of politics. The betting in the Senate Republican cloakroom is that he will retire, but Hagel has given no signal of his intentions and tells friends that he has yet to make a decision. I suspect that most of Ron Paul’s support come from people who are interested in him for additional reasons beyond his opposition to the war. For those who are primarily interested in his opposition to the war, a more mainstream Republican such as Hagel, who does have an outside chance to win if opposition to the war increases among Republicans, might be a more attractive candidate. I would definately consider a third party should it come down to a choice between Edwards and most of the Republican candidates. There is also a possibility that Novack didn’t consider. There has been speculation that Hagel might run as Vice Presidential candidate with Michael Bloomberg on a third party ticket. Such a ticket could attract considerable attention from independents and “Starbucks Republicans” who voted Democratic in 2006 if the Democrats nominate a candidate who is unacceptable to them such as John Edwards. A choice between John Edwards and any of the far right candidates leading for the Republican nomination could leave many voters with no acceptable choice from the major parties and could set up a situation where a third party would have a fighting chance to win. Pattrick Ruffini responds to YearlyKos by turning to the classic question of whose is bigger. While many arguments can be made regarding the increased influence of the liberal as opposed to conservative blogosphere (with Libby reviewing some at Newshoggers), my main concern is over who is right on the issues as opposed to which blogosphere is bigger. I’ll leave it with Libby’s arguments and point out a portion of Pattrick’s post which I found of interest for other reasons. At its height, Free Republic was the Daily Kos of the right. In fact, I think the stratospheric, un-blog-like traffic numbers of Kos can only be explained by Kos finally filling the Free Republic void on the Left. Who could forget shenanigans like sabotaging Gore campaign conference calls with toilets flushing in the background, or the cries of “Get out of Cheney’s house!” Freepers were able to move action virtually anywhere in America. If Daily Kos is the angry left, Free Republic was the angry right — and we were hooked.But Free Republic simply could not succeed in the world of the blogosphere, social media, and Web 2.0. The founders made the decision that they were going to hoard as much traffic on their servers as possible, by posting full-text articles (that eventually got them slapped with high-profile lawsuits from WaPo and the LAT). Early on, links to blogs were verboten. If you expressed your own opinion when starting a thread, that was a “vanity” and it was frowned upon. And fundraising for candidates was strictly forbidden, except for those pet causes approved by Jim Robinson. Their culture was very anti-blog and anti-original content. Today, Free Republic increasingly finds itself marginalized. If you support Rudy Giuliani, who still has a decent shot at being our nominee, you’ve probably been purged. Free Republic’s walled garden approach worked in the days before blogs and broadband, but they actively resisted changing with the times. What we now have is a resource with more unique eyeballs than Kos but one that won’t work with others or push the envelope technologically. What a waste. Imagine how the history of the rightroots could have been different if Free Republic wasn’t still stuck in 1996? What lessons did our activists learn from this? Freepers, who were our best online activists, never learned how to swarm to other sites, to take different kinds of actions, and to raise money for conservative candidates. Just last year, polls found that 64 percent of Americans thought there was “a lot” of scientific disagreement on climate change; only one third thought planetary warming was “mainly caused by things people do.” In contrast, majorities in Europe and Japan recognize a broad consensus among climate experts that greenhouse gases—mostly from the burning of coal, oil and natural gas to power the world’s economies—are altering climate. 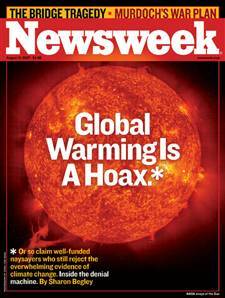 A new NEWSWEEK Poll finds that the influence of the denial machine remains strong. Although the figure is less than in earlier polls, 39 percent of those asked say there is “a lot of disagreement among climate scientists” on the basic question of whether the planet is warming; 42 percent say there is a lot of disagreement that human activities are a major cause of global warming. Only 46 percent say the greenhouse effect is being felt today. Faced with this emerging consensus, the denial machine hardly blinked. There is too much “scientific uncertainty” to justify curbs on greenhouse emissions, William O’Keefe, then a vice president of the American Petroleum Institute and leader of the Global Climate Coalition, suggested in 1996. Virginia’s Michaels echoed that idea in a 1997 op-ed in The Washington Post, describing “a growing contingent of scientists who are increasingly unhappy with the glib forecasts of gloom and doom.” To reinforce the appearance of uncertainty and disagreement, the denial machine churned out white papers and “studies” (not empirical research, but critiques of others’ work). The Marshall Institute, for instance, issued reports by a Harvard University astrophysicist it supported pointing to satellite data showing “no significant warming” of the atmosphere, contrary to the surface warming. The predicted warming, she wrote, “simply isn’t happening according to the satellite[s].” At the time, there was a legitimate case that satellites were more accurate than ground stations, which might be skewed by the unusual warmth of cities where many are sited. Now naysayers tried a new tactic: lists and petitions meant to portray science as hopelessly divided. Just before Kyoto, S. Fred Singer released the “Leipzig Declaration on Global Climate Change.” Singer, who fled Nazi-occupied Austria as a boy, had run the U.S. weather-satellite program in the early 1960s. In the Leipzig petition, just over 100 scientists and others, including TV weathermen, said they “cannot subscribe to the politically inspired world view that envisages climate catastrophes.” Unfortunately, few of the Leipzig signers actually did climate research; they just kibitzed about other people’s. Scientific truth is not decided by majority vote, of course (ask Galileo), but the number of researchers whose empirical studies find that the world is warming and that human activity is partly responsible numbered in the thousands even then. The IPCC report issued this year, for instance, was written by more than 800 climate researchers and vetted by 2,500 scientists from 130 nations. Suddenly, into the ballroom marched an Army sergeant. And this sergeant was on a mission. You could tell, because he was wearing his Class A green Army uniform. Being an Army officer myself, I notice this kind of stuff immediately. My first thought was, “WTF is this guy doing? Has he lost his mind?” The thing is, every soldier knows that you don’t take part in politics while you’re in your uniform. It’s not only highly inappropriate—it’s also illegal. And there’s a good reason for it, too: When you wear the uniform, you are representing the military, and it is essential that the military never, ever wade into politics. That’s what banana republics do—and it causes all kinds problems with regard to democratic processes and corruption. Just look at these fine examples of mixing the uniform with politics and governance: Moammar Qaddafi, Fidel Castro, Saddam Hussein, Manuel Noreiga. It’s just not a good idea—and that’s why we don’t do it. Ever. Period. From accounts at The Fix and various other blogs, it sounds like Barack Obama and John Edwards have been received the best at YearlyKos. Hillary Clinton had problems with defending lobbyists and, in the event I find most interesting, Bill Richardson was booed for backing a constitutional amendment to balance the budget. Scanning the liberal blogosphere the bloggers who comment seem pretty much unanimous in considering the balanced budget amendment a bad idea, while many people commenting supported the idea. This is consistent with a trend I’ve noticed that a large percentage of bloggers on the major liberal blogs have similar ideas on economic matters, while a significant number of individuals who read liberal blogs agree on areas such as the war and social issues but are more fiscally conservative. There are also many independent voters who hold this view, explaining why Richardson is improving in the polls primarily among independents who intend to vote in Democratic caucuses or primaries where this is allowed. I am sympathetic to Richardson on this as, while I have qualms about the idea, a balanced budget amendment is not so awful an idea as to deserve the boos it generated. A balanced budget is generally desirable, but there are times, such as during a war, when deficit spending is necessary. Proposals for a balanced budget typically allow deficit spending with a super majority, but those simply hearing a call for a balanced budget amendment on the stump generally are unaware of this. Even when they do discover this, it often makes the proposal sound more like a gimmick. I would prefer to see Richardson speak of the benefits of a pay as you go policy, as he also does now and John Kerry did in 2004. Ideally voters will vote for candidates who show restraint in spending, seeing the benefits of Bill Clinton over a fiscally irresponsible president such as George Bush. Richardson might be right that further restrictions are necessary against fiscally irresponsible presidents, which would apply to both George Bush who fought a war off the books, as well as to future presidents who adopt the irresponsible attitude of John Edwards of promising everything to everybody with no qualms about paying for it on credit. I wonder if the idea would at least receive less boos from a liberal audience if it was a call for a requirement for a super majority for deficit spending rather than using the politically charged terminology of a balanced budget amendment. The boos are also consistent with the shifting views at Daily Kos. There is a diversity of viewpoints there, but there is also an element of group think at both Daily Kos and in the liberal blogosphere. Many of them respond the most to criticizing George Bush and the war, and the policies to replace Republican policies is a secondary concern. Back when Howard Dean was best identified with opposition to Bush, many at Daily Kos adopted Dean’s fiscally conservative views. John Edwards has been doing the most to attract support in the blogosphere this year, and now many have abandoned Dean’s views for Edwards’ populism. Kos has written about liberal/libertarian fusionism, which would imply some degree of fiscal conservativism, but he is much better at community organization than promoting a consistent political philosophy and this has had little impact at this site.